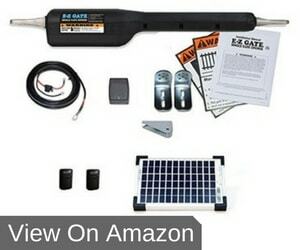 If your daily routine involves getting out of your car, opening the gate, going back inside the car, driving it through the gate, getting out of your car again, closing the gate, and then finally going back to your car to drive to work, then you need to read this Mighty Mule EZGO-SOLAR Gate Opener Kit review. This review is due our investigation to determine if it is really worthy of your time and money. The sun’s rays are a free source of energy that can be stored in an automotive battery then used by an automatic gate opener such as the Mighty Mule EZGO Solar Gate Opener Kit. This single gate opener comes with a solar kit with a 5-watt solar panel gate charger to provide power to your automotive battery. Mighty Mule is the brand behind this product and they have been providing us with different gate openers ever since 1987. They produce DIY gate openers that can be installed successfully even without the help of a professional. Suitable for various gates that are up to 16’ long and 550 lbs. The Mighty Mule EZGO Solar Gate Opener Kit is well-loved because it is easy to install, even if you are not a professional engineer. Although it doesn’t come with the batteries and it moves really slowly, it is still a good purchase because it functions as it should and it is even environment-friendly. Who is this gate opener good for? This gate opener comes with a solar panel that charges the attached automotive battery, and with 2 remote controls, making it possible to store one in the car and one at home at all times. This enables you to carry the remote, but still allows control over the gate for someone who is in your house. Do you want a gate opener that locks or that provides access by using a keypad? This is possible by purchasing additional accessories such as the locks and keypads and integrating them to this gate opener. If you find that this gate opener doesn’t suit your gate, you can try others such as the solar-powered sliding gate opener or a solar powered dual swing gate opener complete system. There are different models offered by Mighty Mule and although they are different models, most of them will be compatible with the additional accessories available for purchase. Although this gate opener includes a solar panel, you still need to purchase an automotive battery separately for it to work. The solar panel is just used to store power in the battery. This gate opener kit is available on Amazon and it comes with a 12-month warranty and technical support. By compiling the Mighty Mule EZGO Solar Gate Opener Kit reviews, and relevant product information, we believe that this is a good automatic gate opener. First of all, it is easy to install, and easy to use with the two remote controls provided. Secondly, there are a number of accessories that can be used to improve your experience when using this product. And lastly, it comes with a 12-month warranty and technical support.